I recently posted about obituaries, so the living dead is, of course, the next step, right? Have you ever watched a horror movie? Yes, probably, okay. Have you ever watched a horror movie with me? In general I am a terrible movie friend. I point out the plot inaccuracies, I’m really good at detecting mistakes in continuity, and when super sappy things happen in romantic comedies and everyone else is going “Le sigh,” I’m cackling like the realist I am (sorry, everyone at the sold out show of He’s Just Not That Into You). Which brings me to zombies. And storytelling. And how the importance of details can never be underestimated, especially when you’re dealing with viewers like me. J: If human zombies make animal noises do animal zombies make human noises? Me: “Hello, ma’am, mind if I eat your brains?” – Zombie Cow. ARE there animal zombies? I mean, do you think the zombie virus is interspeciel? J: Let’s say it is…or, let’s say it isn’t…doesn’t matter, but let’s say we do know that there is a virus that makes animal zombies…*pauses for dramatic effect*…do they stagger too? At this point in the conversation J and I lost interest in animal zombies…or, more likely, were both overwhelmed at the possibilities, and we turned back to the regularly scheduled television program. M: Where do these people go to the bathroom? I mean, they’re in a prison but is the plumbing functioning? Because there may be generators to run the prison’s electrical grid, but they sure don’t seem to have done any laundry lately which makes me wonder if they have functioning toilets. J: I don’t know. I wish shows and movies in this genre would answer logistical questions like this! But does he make balloon animals? And does he give a discount if the children at the birthday party are alive? M: Aha! Someone FINALLY answers the stupid logistical question I tend to always wonder about! J: Still doesn’t answer the laundry question. M: True, I mean, aren’t they supposed to be, like, less than a few miles from the nearest town? Couldn’t they go raiding and find new clothes in abandoned homes and stores? J: If they can get baby formula and toilet paper, they can make time to find a change of underwear. And THIS, my friends, is why it’s important to think about the details of your story. Because ridiculous people like me and my friend, J, have high expectations and will blow a hole through your trope if given the chance. So What’s the Lesson for Brands? 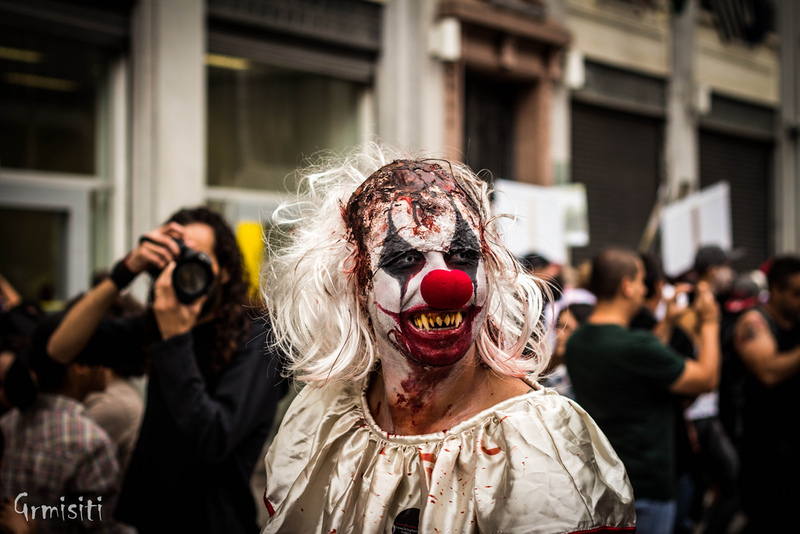 Your brand story probably won’t include zombies, but it is important to put yourself in your audience’s shoes and ask the questions they will ask BEFORE you hit publish. What are your assumptions about what they already know? What is the reality? What blanks are you going to need to fill in in order to bridge this gap? The problem with this diagram is that we always think the purple part is bigger. 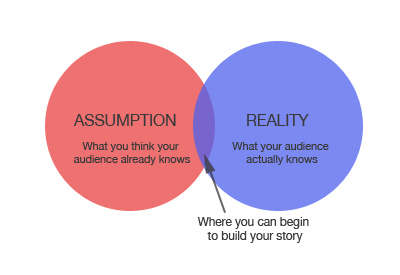 In reality you can’t assume your audience knows everything you do about your brand. For example, you may know the past 60 years of your brand’s history by heart, but the story you are developing may be geared toward new customers, i.e. those who are unfamiliar with the advancements, industry knowledge, and growth that brought your business to where it is today. If that’s important to the story you plan to tell, then you need to find a way to add it into the narrative in order to bring your audience up to speed. Audience Awareness is key to choosing your tone, content, and language, and making sure that your message gets filled in with all of the details your audience needs to stay engaged.